Auburn Hills, MI - The 2005 Jeep® Grand Cherokee blends past and future by evolving its heritage into a sophisticated and contemporary execution of an icon while using state-of-the-art technology to produce the highest quality vehicle possible. The 2005 Jeep Grand Cherokee was designed and engineered under the Chrysler Development System (CDS), the comprehensive, coordinated and disciplined product creation process that improves quality and speed-to-market while reducing costs and encouraging practical innovation in new products. An emphasis in CDS is the systems engineering, design and up-front planning to avoid time-consuming and costly trial and error or changes during the latter phases of the product development cycle. With CDS, all product and process planning is completed and fully integrated before production tooling begins. The system works: For Grand Cherokee alone, warranty repairs and expenses have been reduced by more than 60 percent in the past five years. In external quality metrics, the Chrysler Group brands continue to make dramatic year-over-year improvements, prompting the results in one quality image survey, known as the Strategic Position Study, to show a four percent improvement – more than any other manufacturer in the study. The improvements in quality are reinforced with the 7-year/70,000 mile Limited Powertrain Warranty on the Jeep Grand Cherokee and other Chrysler Group products. Development of the 2005 Jeep Grand Cherokee involved the work of hundreds of engineers along with the world-class testing facilities at the DaimlerChrysler Technology Center (DCTC) in Auburn Hills, Mich., and proving grounds located in Michigan and Arizona. These engineers logged more than seven million miles of customer equivalent driving and experience in the vehicle. The vehicle also benefited from a new $37 million Aero-Acoustic Wind Tunnel at the company’s Technology Center, which was completed in the summer of 2002, along with environmental simulators on site. Engineers had the opportunity to test early, full-size clay models more than 700 times to analyze various configurations of the design to make aerodynamic changes as well as to validate cooling and wind noise goals. For example, dynamic sealing (essentially, weather strips) were strategically placed throughout the vehicle as a result of items learned during testing. Exact placement of the sealing included additional cut line coverage to decrease wind noise; lower coverage to decrease road noise; and, upper auxiliary seals improve water and wind management. In addition, an increased use of cavity foam and environmentally friendly water-borne sound dampening were applied in the body and paint sealing process at the manufacturing level as a result of the testing. In fact, literally hundreds of hours were spent in test labs to minimize noise, vibration and harshness (NVH). In the area of wind noise, testing revealed many reduction enablers to assist in the design, NVH and engineering process. This included the ultimate shaping of mirrors, A-pillar geometry, thickness on side glass portions, and seals on the door glass runs and at the upper C-pillar and lift gate. In addition to wind noise reductions, the team used extensive testing and data to refine the new Grand Cherokee’s powertrain, providing both hardware refinements and acoustic treatments. In particular, control of critical axle assemblies – such as ring and pinion mesh profiles that were selected for minimum gear noise – were key factors in NVH reductions. In addition, individual component and system balancing, as well as tightened tolerances on the rear drive shafts, were elements that were implemented early in the vehicle’s development. Grand Cherokee vehicles underwent extreme body torsion and suspension articulation in tests such as “AK3”. AK3 is derived from the original test used to qualify Jeep vehicles for military use. Several of the new Grand Cherokee vehicles successfully completed back-to-back AK3 cycles. This helps to ensure that the new Grand Cherokee will meet or exceed customer durability and reliability requirements. Four separate “Lap of America” trips were initiated during the phases of development to validate all aspects of vehicle performance to Jeep customer requirements. Trips from Detroit to all areas of the United States were taken to ensure the function of all systems under all ranges of customer use, including trailer tow and altitude testing. Chile Cold weather validation and altitude test to 14,000 ft.
All of these elements are proof that not only is there “one” Jeep, but one type of Jeep testing when it comes to quality: Extreme. Practical innovation is applied to the all-new 2005 Jeep® Grand Cherokee through integrated safety and security features designed in from the beginning. Systems such as Electronic Limited Slip Differentials and available Electronic Stability Program (ESP) contribute to the Grand Cherokee’s exceptional vehicle dynamics. Advanced multistage front and available side curtain air bags, tire pressure monitoring system, ParkSense™ (rear park assist), UConnect™ hands-free communications, REC navigation system and all-new SmartBeam® headlamps offer the latest innovation in occupant protection, safety and security on the road. "Applying the latest available technology to protect occupants is of utmost importance to the Chrysler Group," said Craig Love, Vice President – Rear Wheel Drive Product Team and Core Team Leader. "By integrating safety and security technologies during the design phase, we’re able to offer our customers the tools to avoid collisions as well as protection in the event of a collision." Chrysler Group’s vehicle development engineers test beyond current regulations to ensure optimum performance and to improve vehicle safety. They evaluated the Jeep Grand Cherokee with tests beyond current government mandates, such as 40 mph front offset and 50 mph rear impact tests. The 40 mph front impact simulates a high-speed vehicle-to-vehicle crash. The 50 mph offset rear-impact test evaluates fuel system integrity when a vehicle is hit from behind on the side nearest the fuel filler tube at high speeds. In addition, Chrysler Group engineers used pole tests to evaluate occupant protection and concentrated side loading. These tests mimic accidents with narrow objects, such as hitting a telephone pole or tree, to evaluate the side-air bag sensing system. Crash examples may be severe because the crash forces are concentrated in a relatively small area of the vehicle. 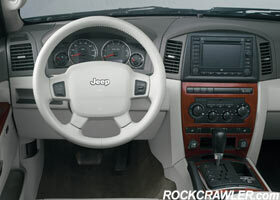 The 1993 Jeep Grand Cherokee was the first sport-utility vehicle to be equipped with a driver’s side air bag. The Jeep Grand Cherokee continues to be equipped with the latest technology, like advanced multistage air bags with an occupant classification system (OCS) for the front passenger occupant. This system classifies the severity of an impact event and uses additional sensor information to further modify passenger air bag output for smaller occupants. The resulting deployment could be low, medium or high output, or – in certain instances – none at all. However, even with this advanced system designed to meet government requirements, all occupants are advised to always sit properly in their seat with the seat belt fastened. Children 12 and under should always be in a back seat correctly using an infant or child restraint system or the seat belt positioned correctly for the child’s age and weight. State-of-the-art energy management features in the body structure and chassis work in conjunction with air bag and seatbelt systems. Front seat belts are equipped with belt pretensioners and constant force retractors. Pretensioners tighten the seat belt to help keep the occupant in place while constant force retractors balance the load on the upper body, reducing injuries from excessive seat belt forces. Head restraints are standard in every seating position. The driver’s side is also equipped with BeltAlert® – an enhanced seat belt reminder system that periodically activates a chime and illuminates a light in the instrument cluster to remind the driver to buckle up. To optimize overall driving performance, the Jeep Grand Cherokee offers ESP. This helps the driver maintain directional stability on dry pavement, in rain, snow or on ice. The Anti-Lock Brake System (ABS) is equipped with electronic sensors that help to prevent wheel lockup, and provide excellent stability and steerability during braking on virtually every type of road surface. ParkSense™ – rear park assist – helps the driver detect stationary objects while the vehicle is moving in reverse. Tire pressure monitoring (TPM) is standard on all Jeep Grand Cherokees. The system includes pressure sensor modules that are integrated with the valve stems of all four road wheels as well as the spare tire. Each module sends continuous radio frequency signals to a receiver and informs occupants when the pressure is too low. The TPM system displays tire pressure through the Electronic Vehicle Information Center.